It's been awhile since I trail ran due to the awesome cycling weather here in SoCal. This past weekend, I did just that. Before I headed out to the trails, I needed to grab a new pair of trail running shoes. I've always loved my Salomon Speedcross 3's, but recently I've been getting blisters on the tops of my toes. I headed over to my second home at REI, and went Christmas shopping. It didn't take too long to realize that I have a high mid-arch. Basically my Salmon's are a size 10, and that's fine when I was fitted while sitting, but once I stand up, my feet flatten out to an 11.5. No wonder my poor toes started to get blisters. I absolutely love the tread pattern on the Salomon's, but for fit and comfort, my next shoes quickly became the La Sportiva Ultra Raptors. I've read great reviews on these shoes and decided to break them in up a mountain for the first time. I headed over to Mount Wilson near Arcadia, purchased my Adventure Pass and laced up my new shoes. The trail is roughly a half marathon in distance, with beautiful views and quite some elevation. When you first pass the gate, you descend down a paved road to the trail. Once on the trail, you'll experience beautiful rolling terrain and you'll pass many old cabins that are still occupied. The only way to these cabins are by simply hiking in with all your supplies. At first I got a bit lost and made a right instead of making a left. I'm certainly glad I took this minor detour as the trailhead spit me out right at the base of a waterfall. After a few minutes of taking in this beautiful site, I turned around and went exploring for the correct trailhead. It wasn't long before I was back on track. The trail curves up and around the waterfall leaving you on the edge looking down at all the other hikers in awe. From the waterfall base, the trail takes a rapid incline and it's up, up, and away. I'd say you're gonna climb roughly 3700 feet in 5 miles. I knew that the tough incline, would result in a fast descend. As I approached a dry riverbed riddled with eroded rocks, I was in the groove with my music playing aloud in order to reduce the chance of scaring a bear along the way. I suddenly stopped dead in my tracks. A few yards away, I was eye to eye with a majestic deer that seemed to have no fear of me or my music. Perhaps he was a fan of Mumford and Sons. The deer approached and came closer and closer. 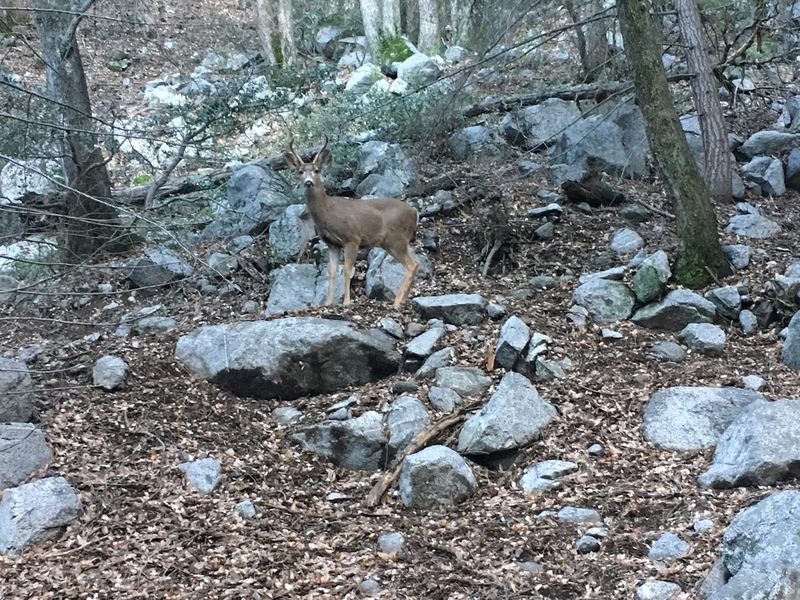 As I reached for my camera, my gloves prevented me from snapping a photo of how close the deer was to me, but I was able to get one regardless. After the deer realized I posed no danger, it went on it's merry way. I then raced for the top of Mount Wilson. I was about a mile from the top, but gauging the time of day and the remaining sunlight on the East side of the mountain, I decided to turn around and run back. I made great time on my way back, until the beginning roadway. That was a slow and steady hike back up to the car. I'm glad I was able to experience Mount Wilson and what it has to offer. I will definitely be back.